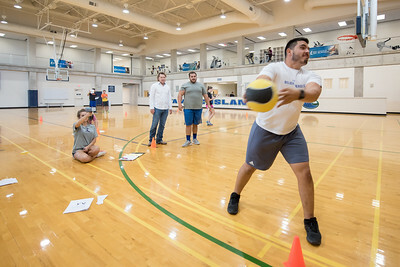 The Island University’s Graduate Strength and Conditioning Program has once again met National Strength and Conditioning Association (NSCA) criteria for programs which provide foundational support for student excellence, as well as long-term professional success after graduation. The NSCA Educational Recognition Program certification, which is valid for three years, Sept. 2017 through Sept. 2020, extends Texas A&M University-Corpus Christi as one of only 19 institutions worldwide with NSCA certifications at both the undergraduate and graduate level. 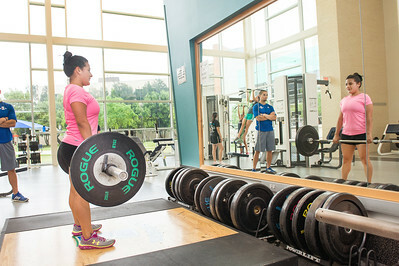 Leticia Zavala works on her form in her strength & conditioning for women class in the Dugan Wellness Center. Dr Frank Spaniol tests students in his Measurement and Evaluation class.